Nikki Haley strongly condemned Russian actions at an emergency U.N. meeting today about recent upticks in violence in the eastern Ukraine Donbass region between Russian-backed separatists and the Ukrainian army. QuoteThe dire situation in Eastern Ukraine is one that requires clear and strong condemnation of Russian actions... This escalation of violence must stop. She called on Russia and Ukraine to uphold the Minsk I and II agreements to restore the ceasefire and pull out heavy artillery from the disputed region, which has been in turmoil since 2014 when Ukraine President Viktor Yanukovytch was ousted and Russia annexed Crimea. 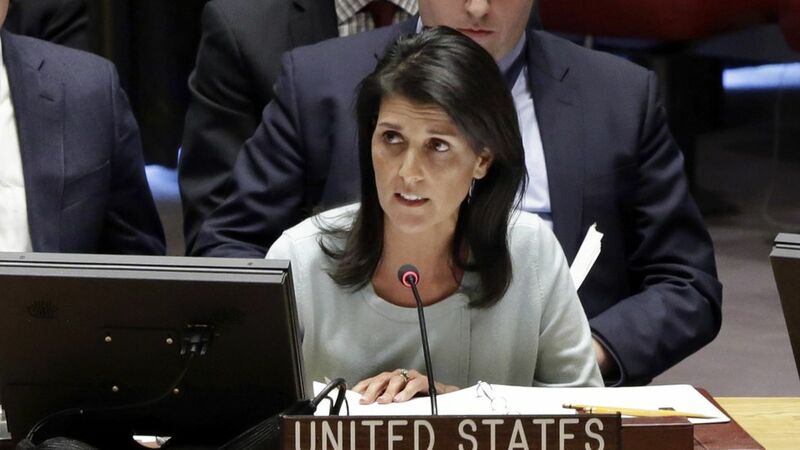 Haley added that U.S. sanctions against Russia regarding its "occupation" of Crimea would remain in place until Russia returns control over the peninsula to Ukraine. Why this matters: Haley used clear and strong language against Russia — much stronger than Trump used on the campaign trail, and much stronger than the U.S. State Department language released the day after fighting broke out this week. Remember, Trump previously said he might recognize the annexation, and experts have been saying the new clashes may have been a test from Russia to see whether Trump's team is willing to be friendlier to Russian interests.